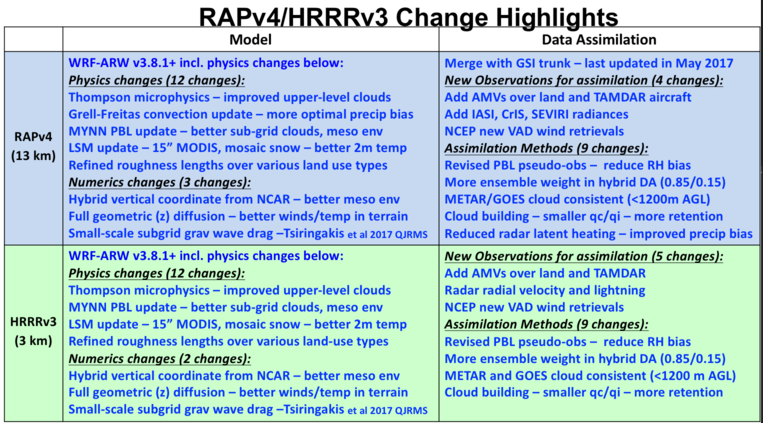 The Rapid Refresh is the continental-scale NOAA hourly-updated assimilation/modeling system operational at NCEP. RAP covers North America and is comprised primarily of a numerical forecast model and an analysis/assimilation system to initialize that model. RAP is complemented by the higher-resolution 3km High-Resolution Rapid Refresh (HRRR) model, which is also updated hourly and covering a smaller geographic domain. Experimental HRRRv2/RAPv3 implemented at ESRL 1 Jan 2015. Complete RAP (v1-v3) description in Benjamin et al. 2016, A North American Hourly Assimilation and Model Forecast Cycle: The Rapid Refresh. Mon. Wea. Rev., 144, 1669-1694.